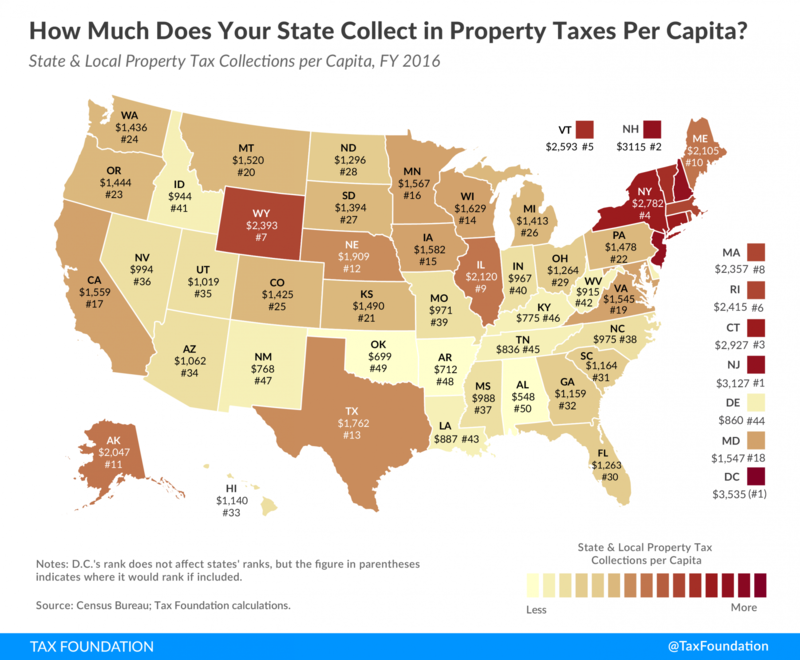 Home /Blog/How Much Does Your State Collect in Property Taxes Per Capita? Property taxes are an important source of revenue for local and state governments. In fiscal year (FY) 2016 (the most recent year of data available), property taxes generated 31.5 percent of total U.S. state and local tax collections and 72 percent of local tax collections. Local governments rely heavily on property taxes to fund schools, roads, police departments, fire and emergency medical services, as well as other services associated with residency or property ownership. On average, state and local governments collected $1,556 per capita in property taxes nationwide in FY 2016, but collections vary widely from state to state. The highest state and local property tax collections per capita are found in the District of Columbia ($3,535), followed by New Jersey ($3,127), New Hampshire ($3,115), Connecticut ($2,927), New York ($2,782), and Vermont ($2,593). Meanwhile, the lowest collections per capita are found in Alabama ($548), Oklahoma ($699), Arkansas ($712), New Mexico ($768), and Kentucky ($775). It’s important to keep in mind that property taxes vary not only from state to state but also within states. While property taxes inevitably draw the ire of some residents living in high-tax jurisdictions, they are largely rooted in the “benefit principle,” meaning property taxes can be viewed as a payment for public services received. At the same time, good local public services can make municipalities more desirable, thereby increasing residential property value. As such, higher property taxes tend to be found in urban and higher-income areas. Further, property tax collection practices vary from state to state, and sometimes within states. While some jurisdictions impose a rate or millage on the fair market value of property, others impose property taxes on some percentage (the assessment ratio) of the property’s fair market value, yielding an assessed value.